The Weekend Gourmet: Celebrating National Brownie Day with a Betty Crocker Prize Pack Giveaway...and Chai Tea Latte to Wash 'em Down! Celebrating National Brownie Day with a Betty Crocker Prize Pack Giveaway...and Chai Tea Latte to Wash 'em Down! I was thrilled when I learned that Thursday was National Brownie Day! How serendipitous is that I just so happen to have a cool brownie prize pack to give to one of you courtesy of My Blog Spark? Talk about great timing! During the holidays, we’re all pressed for time and seem to have a gazillion places to be and parties to attend. Sometimes you need a quick treat that you can whip up in no time flat. Betty Crocker recently introduced a milk chocolate brownie mix that's really delish…with a chocolate flavor that's a bit more subtle than darker, fudgier brownies. You can eat them straight from the pan…or use them as a base for holiday goodies…add some peppermint icing perhaps? 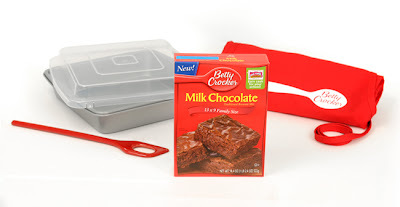 My Blog Spark sent me a really cool prize pack recently that contains a box of the milk chocolate brownie mix, a really nice covered 8x8 Wilton non-stick baking pan, a fun stirring spoon that takes care of any lumps in the batter, and a red Betty Crocker logo apron. Even better? One of you is going to win one of these cool prize packs too…stay tuned for details on how to enter the giveaway at the end of this post. I'm doing this giveaway a bit differently than I usually do...just to keep things interesting! I decided to be a purist and serve these brownies as is…no additions, just straight-up milk chocolate goodness! Mainly because I wanted to surprise Michael with one of his favorite cool-weather drinks: chai tea to enjoy with our brownie dessert. We first tasted chai at The Doughnut Plant in New York last year…one sip, and we were immediately hooked. Milky tea infused with exotic spices and just the right amount of sweetness…so good! I went on a quest to find a chai tea recipe that I could make at home. Short of hopping a plane, I think I’ve managed to find a fantastic recipe! The spices should be available at most larger grocery stores…once you locate the spices, this chai tea latte basically comes together in the time it takes to bake the brownies. Step 1: Add the following spices to a heavy saucepan: 8 smashed green cardamom pods, 6 black peppercorns, 3 whole cloves, 6 grates of a fresh nutmeg, 2-3 cinnamon sticks, and 2 thin slices fresh ginger. Add 3 cups whole milk and stir. Heat on medium until the milk starts to simmer. Reduce heat to low. Add half of a vanilla bean and 4 tbs. packed brown sugar to the milk-spice mixture. Whisk until the sugar is dissolved. Step 2: Reduce heat to low and add 1 cup water and four bags of black tea. Steep for 10-15 minutes. Strain the chai through a mesh sieve to remove the spices. Pour the chai tea latte into mugs -- you should get 2-3 servings, depending on the size of your mugs. Top with whipped cream and a bit of freshly grated nutmeg if you want to up the indulgence factor a bit! Sweet, chewy brownies paired with creamy, exotic chai tea latte…what a fantastic way to stay warm on a chilly night! Don’t get me wrong…I love hot cocoa as much as the next gal, but sometimes you want something a little different. This chai tea latte is definitely that…and it really does pair perfectly with the milder milk chocolate brownies. Now you know how we’re celebrating National Brownie Day (…er Night) at Casa Garcia. With a brownie (or two…) and mugs of chai tea latte! To enter the giveaway for this fab Betty Crocker Milk Chocolate Brownie prize pack, here’s what you need to to…the rules are slightly different this time. Please Like The Weekend Gourmet on Facebook…or leave a comment on my Facebook page letting me know you already follow via Facebook and want to enter the giveaway. I’ll pick a winner on Sunday afternoon and notify them via Twitter, Facebook, and e-mail. Be there, or be square! !